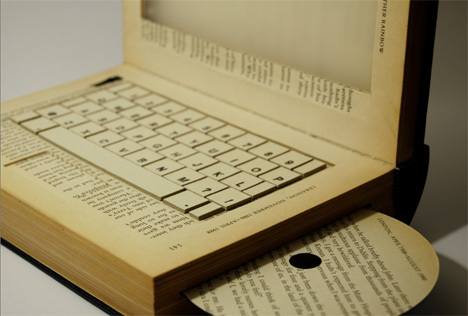 The Future of Books: Turn Them Into Computers? When you think back to the way things were just 20 or 30 years ago, it’s clear that high technology has drastically changed the way we do just about everything. But nowhere is that more true than in the way we research and read. We used to visit the library for information, pull a book down off of a shelf and leaf through the pages. Today, we have access to vast amounts of information right from our homes. That’s what English artist Kyle Bean wanted to examine in this project, which he calls “The Future of Books.” He started with a book purchased from a discount bookstore and transformed it into a one-of-a-kind laptop. The finished product still looks like a regular book when closed, complete with its title on the spine. 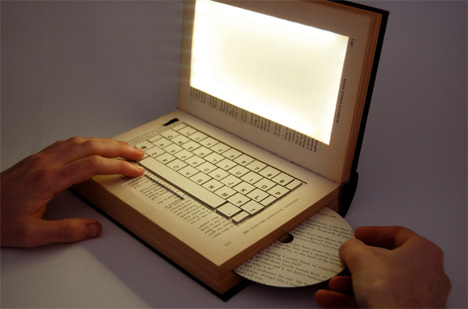 But open it up and you’ll find a stylized keyboard and a screen that lights up. There’s a battery under the removable keyboard, and a CD-ROM drive holds a CD that features text from a page of the book. This concept isn’t a working computer, but it’s a great art piece that examines our relationship with technology. Bibliophiles know that researching online can’t hold a candle to walking into a library and savoring the sights and smells there, but the technology we use instead allows us to do more with our time. 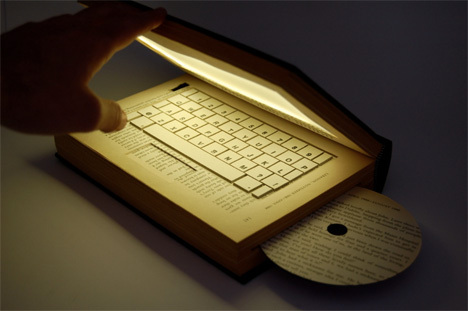 Those bibliophiles would probably be first in line to buy this laptop if a working model ever did go into production. See more in Art of Tech or under Technology. November, 2009.